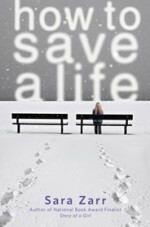 HOW TO SAVE A LIFE is the first book I’ve read by Sara Zarr, but it won't be the last. I started reading the book this morning and just finished, and all I really want to do is run out and buy everything else Sara Zarr has ever written. So yeah, it’s good. The story, a contemporary YA, is about Jill, who is coping with her father’s death, and Mandy, who is eighteen and pregnant. Jill’s mom decides she wants to adopt Mandy’s baby, which is how the three of them all end up living together. If you want more of a summary than that, then you’ll just have to read the book. But this book is about so much more than these three characters. It’s about life and loss and what it means to be family. It’s about letting people in, letting them love you and see you even though you are flawed and will never live up to their expectations. Or sometimes your own, for that matter. Zarr does an amazing job of creating flawed characters who you root for. It’s not easy creating multi-dimensional characters, ones who are so real they must live somewhere other than between the covers of the book, but Zarr has done just that. All of the characters are well-developed – not just Jill and Mandy, who alternate telling the story. Jill’s mom and Jill’s boyfriend Dylan and new friend Ravi are fleshed out so perfectly. Even Mandy’s mom, who is really only in the book through Mandy’s memories, is thoroughly developed. Though I must admit, I didn’t like her and could only see her flaws. But through her character, I understood Mandy that much better. The story is tight as well. It had emotional resonance without being maudlin or trying to manipulate me. If there is one thing I hate as a reader, it’s being manipulated. This story allowed to dislike certain things about a character while still seeing the good in that character. Zarr never told me how I was supposed to feel about a situation. She let the story unfold on the page and allowed me, the reader, to make up my mind how I felt about that. This is a story of hope, but it’s not cheesy or saccharine sweet. Finally, the writing. These days I find it so hard to find a book that has both great writing and great story. Usually, it has one or the other, so when I find a book that has both, I’m thrilled. I’m not hating on writers, because I am one, and I know just how hard it is to get both story and writing to blossom at the same time. So when it does happen, I have to stop and applaud the writer, because as a reader I am fully satisfied, and as a writer I am in awe. I read plenty of books that I don’t like in one way or another. Some are good but not great. Some are pretty awful. You won’t see me reviewing those books here. I don't believe in giving a glowing review to a book that hasn’t earned it, but I also won't waste space pointing out the flaws of a book I didn’t really like. That’s for others to do. My job here is to crow about the ones I do love – the ones that I want to buy for all my friends, the ones that inspire me to work harder at my own craft. This is one of those books. Thanks, Sara Zarr, for crafting this book just for me. It feels that way at least, like all the best ones should. This book managed to break my heart and then slowly piece it back together again. And for that, I say fantastic job, Sara Zarr.